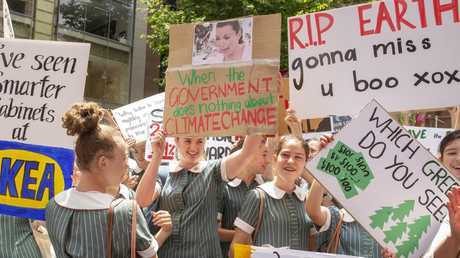 Let me be blunt: The idea of schoolchildren wagging school for a day to protest about climate change horrifies me. Particularly when adults who should know better use scare tactics to lure them out of the classroom and out on the streets. 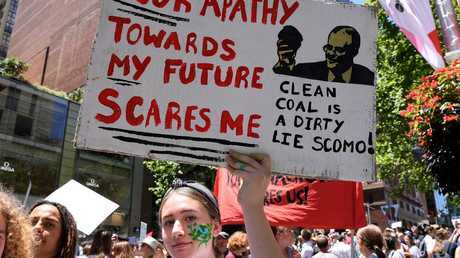 As you may have heard, thousands of children - our sons and daughters - are being used to promote climate change politics and protest against resources like the Adani coal mine when rarely they are given perspective. And with school students giddy with virtue and planning to skip class for climate change as part of a global event on March 15, as parents we don't have the luxury of dismissing it as a harmless chapter of growing up. Science is not divorced from politics in any arena our kids now inhabit. But science is the mortal enemy of ideology. This is the message schoolchildren need to hear. And it was a grocery trip recently that crystallised my fear that we are not tutoring malleableminds about cold hard facts related to change, climate, warmth, bleaching or melting. A mother next to me in the milk aisle - and yes she selected the supermarket own brand without a hint of irony - was humblebragging about her daughters who deemed it "cool" to strike for climate change. Raking her fingers through her thick ash-blonde mane and with a trolley overflowing with plastic, she declared: "You know, they're really on board with what their father and I tell them about how it is so much hotter now than when we were kids and all us living now are to blame for more floods and bushfires and stuff. "The planet is doomed unless they do something about it." As I lingered with my own full-fat two litres, I heard the conversation move on to holidays and how will tiger mum and her cubs cope, in a couple of months' time, with sitting for hours and hours on a carbon belching jet to Europe. In other words, have fun waving your placards darlings but we'll still keep flying and driving and consuming wherever and whatever you want. Because when you hear of kids chanting slogans, don't you think to yourself: more learning and less activism in schools please, for goodness sake? And more to the point, hasn't climate change always occurred? Haven't we in this country always had decades of droughts and flooding? Show me the definitive expert who can prove to me and my kids that we in 2019 are the Class A enviro butchers. I applaud anyone with the courage to stand up publicly for what they believe in, provided they know what that is. In this case, I am not convinced. Maybe some of these children understand what the conflicting issues are but most are probably just going along for the ride. And these are the kids who should be in school learning - scientifically and without emotion - about the very issues for which they purport to be protesting. Instead, as The Daily Telegraph has reported, activists have been given control of the sustainability curriculum. I'm sure they're hearing both sides of the story. Not. At least the NSW Government has seen sense by warning that any student wagging school will be marked absent and face disciplinary action. I hope that applies to the radical teachers stirring them up. The March 15 event will coincide with school protests in more than 40 other countries. The message is: "To everyone who cares about a safe climate future, this is your open invite to join our school strike 4 climate - students standing up when our politicians won't. 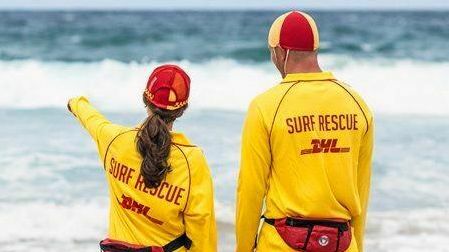 "Australia is in the thick of the climate crisis. Prolonged drought cripples farming communities. Flash flooding is creating chaos in cities. Catastrophic bushfires and severe cyclones threaten people's homes. Heatwaves are sweeping the nation. "Half the Great Barrier Reef is dead. "A Federal Election is around the corner but our politicians have lost touch with the people they were elected to represent - us! As school students, we're sick of being ignored. We're sick of our futures being turned into political footballs. The uphill battle we are facing to detox kids from political activists disguised as left leaning teachers is illustrated in a ludicrous piece this week by a Guardian writer who advised kids to adopt this mindset: "The world has been thrown into climate chaos, caused by fossil fuel companies, the billionaires who profit from them and the politicians they have bought. 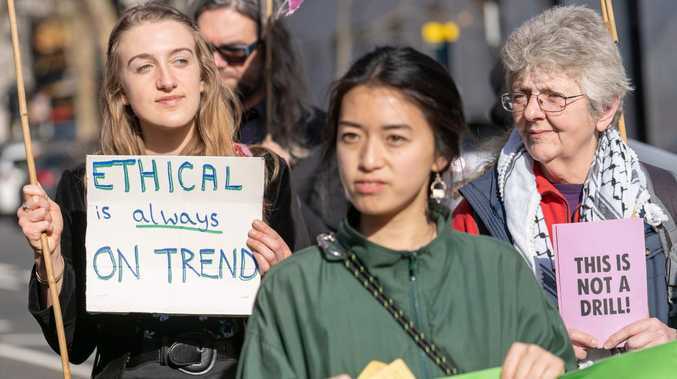 "But we, the young heroes, will confront these oligarchs, using our moral authority to create a movement so big and politically dangerous that our governments are forced to shut down the fossil economy and restore the benign conditions in which humans and other species can thrive." Benign conditions? Is that code for sky high power bills? Last November we treated to the spectacle of thousands of children dumping class to protest against "government inaction on climate change". 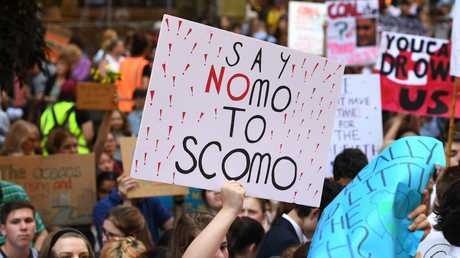 Children, their parents and their beloved teachers swarmed Sydney's CBD chanting "ScoMo's got to go", referring to the PM, plus a fair amount of "cool" profanity to reinforce the message. "F**k ScoMo", "I hate ScoMo more than I hate school", and "Scum-mo is a b**ch and so on. How delightful. Those virtue signalling tiger mums like the one I observed must have been so proud. We are teaching them to get what they want by abandoning their studies to stand in the street and shout profanities at our leaders of government. Love them or hate them, they are our leaders - shouldn't we be teaching respect for our highest office? And why do these kids have to take time off school to protest? Because the adults pulling their puppet strings deems it won't grab enough headlines if it carries on after Saturday sport. I wonder if these mini-me protesters would happily give up their annual trade-up to the next model Apple watch, iPad, iPhone or computer, not because they needed it but because it was better and they wanted it and all their friends had it. Are those holier-than-thou parents going to explain why they need to keep their devices for at least five years to minimise their environmental footprint? As far as I'm concerned, the only thing worth protesting is the use of kids to make a political point.